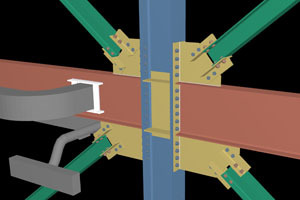 Structural Engineering & Design points out, "As an industry leader, Design Data's SDS/2 software has been sharing model information between engineering software and other software products for more than 10 years." In Structural Engineering & Design's June 2010 issue, the magazine featured an article dedicated to examining the sustainable future of structural steel. In part, the article relied on the expertise of Design Data to take a closer look at the state of the industry. The article, titled "A sustainable future: Industry experts weigh in on the strengths of structural steel," looked at factors affecting the market share of structural steel and how it relates to the sustainable buildings movement. One of the highlights of the article included a look at the importance of the Building Information Modeling (BIM) work process, and how technology plays a prominent role in that part of the equation. As Design Data's Michelle Eret stated in the article, the company is responding to the market with product offerings to fit the new work processes involved in project delivery. "All project partners are required to communicate at a higher level and our new products and features make this task much easier. Design Data is releasing a new project — Engineering Analysis and Design, or EAD/2 — that will automatically design connections and prepare the model for fabrication with all bolts, holes, welds, and plates... In addition, we have added many new features in our detailing product...to make paperless approval and model approval very easy to match new work processes." To read the complete article from Structural Engineering & Design, click here.